In the past, many SEO tutorials were included in our site.This article simply introduces On Page SEO Tips.So, before this article, Refer to the articles we previously presented.Then you will be able to understand the article better today. When surfing your website or any other website, you should focus your attention on the site's activities, such as On-Site-SEO.Firstly, you must set up your website in a friendly way in search engines.Next, you need to do a keyword research and find the best Keywords related to the site.In the end, you need to make Backlink and Off-Page-SEO for get best search engine result with Keywords.So, you should also consider these On Page SEO tips. The most important thing you should keep in mind is that it's quick to get the results of SEO.Keep in mind that this is a very valuable investment that results in longer term.It may take up to three months, six months, one year or even a year to arrive at the results.Today, through this article, we bring you points through the above mentioned on-page SEO activities.If these activities are done correctly, your site will be coming a top result of the search engines. If you include Contents from other sites on your site, be sure to remove them as soon as possible. Because Google treats it as an insane activity.They do not give priority to such websites.Post new unique articles and creative hard work as much as possible.In that case, do not copy and paste other site content Incorporate always important things.Spend your first attention to creating these content in SEO.Google still has not forgotten 'Contents is the King'. When your article appears in a search engine, it first shows the Title.This makes the Title a very important task.It's always important to use between 7-8 words, 40-55 long title.It is important to include the keyword that you are creating. In the google search result,There is a brief description of the title.This too is a very important part of your site's SEO efforts.You can also enter this to your site via Meta tags.If you do not enter this, it will show on Google in the relevant row of the relevant article.Therefore, it is important to prepare this for yourself.Always show your key keywords here. This means that tags or Keywords are needed to classify your article.We've talked about this before. Also read: Is SEO relevant to Meta Keywords? You can use different links to posts and pages on your site.But it can be useful for SEO.We need to convert it to SEO friendly.Some of the links below are ignored by Google. The following are the web addresses that are approved by Google. You may think that you have a website in another language.So you want to make the web address according to that language.Do not make too long your web address.Having 5-6 words is enough. If you've been studying Web Design, you may not already be aware of Heading Tags.The Heading Tags, such as H1, H2, ... ..H6, can help you to highlight specific issues in your article by using H1, H2, ... ..H6 according to their importance.These Heading Tags focus on other search engines, including Google, and can further expand your key keywords.Be sure not to use these Body Tags too much.So be wise to do what is right. When you target a certain keyword across a article, it is very often used repeatedly in many places.This will be ignored by Google as spamming.This can be done through a few articles, but you can permanently remove them from the Algorithm (or Paneltylize).Therefore, it is enough to include the word you expect from 5-6 times.This is interpreted in many places by the fact that 100 words must be fixed between 2-5 words.Keyword Density is required to be 2-5%. Also include your Keywords in the Image Alt Tags. Minimize as much as you can to add unnecessary plugins, videos, and large images to your site.This increases your site speed and makes it easy for readers to use your site.Also, if your site is too long to be loaded, your readers will go away to other websites.Therefore, you should be very concerned about this.And unnecessary advertisements also reduce the speed of the site. Bounce Rate shows how readers come from a website that is responsible for the time spent on the site.You think someone is coming to your site.He goes back in a few seconds.The bounce rate increases.If someone longs on your site,it will reduce the Bounce Rate.You can always reduce this value by writing important and long articles.Google places more emphasis on sites with less bounce rates. This is only the Search Engine Optimization activities you need to do in your site. Without any of these, you will not be able to perform any outside activities.We will bring in these more important articles. 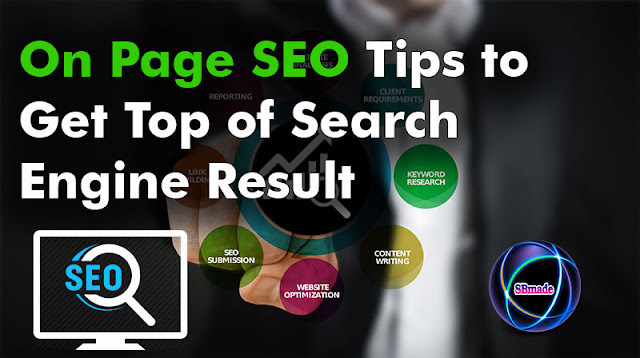 So you know about On Page SEO Tips to Get Top of Search Engine Result , Hope you like the post, don’t forget to share it with your friends and leave a comment below if you are facing any problem at any step in the method discussed above.Thank you.